Hello everyone, and welcome back to the Underdog’s Corner! After the full set release of Dominaria, I looked at each legend in the set and started to preemptively make a list of commanders to write about. Just like our resident wheeling and dealing writer, Matt Morgan, I was betting that Muldrotha, the Gravetide would be the set’s most popular commander. After that, the Big 4 was likely to be rounded out by Jodah, Slimefoot, and Jhoira. That remains true with Tatyova, Benthic Druid and Firesong and Sunspeaker not too far far behind. Since release we’ve been able to see what commanders have made their claim at the top. With so many legends, I decided for the first several articles in this series that I would only write about commanders who were in the bottom 50%. There were several commanders that I figured would be “underdogs” but would still be popular enough to break it into the Top 50%. However, our commander this week, Naban, Dean of Iteration, didn’t do that, and I’m here to tell you why he should have. Post-release, I fully expected Naban, Dean of Iteration to be popular as a member of the 99 in several decks. Tribal decks have shown to be very popular, and unlike many of the other tribes that have been supported in the past year and a half, Wizards are the only type that is Class-based rather than Race-based. This means that there are inherently going to be a greater density of cards available. The recent release of Inalla, Archmage Ritualist made sure that Naban would see play, and even the venerated Azami, Lady of Scrolls could likely find use with Naban in the 99. I originally didn’t give Naban a shot to helm his own deck. I figured he would be windmill-slammed into Inalla, and that would be the end of it. In hindsight, this attitude is likely widespread and a main contributor to why Naban is currently sitting as the 25th most popular commander on EDHREC with 17 decks. However, the more I thought about and read about Naban, the more I started to take an interest in him. That’s when the pieces started to come together, and I started to see the big picture of what Naban could truly be as a commander. So why do I have such a high opinion of Naban? First, he’s cheap. To me, having access to your general early and often is very appealing, and Naban checks that box by costing only two mana. It’ll be sad if Naban inexplicably dies before he rounds the table, but casting him a second time for four mana still doesn’t hurt. Building around a cheap commander also means that we can consistently count on having access to our general’s effect. Unlike five or six mana commanders who quickly become very difficult to cast, it’s not until the third time we cast Naban that he reaches those levels of mana. Another reason that I am so high on Naban is that his ability is free. Paying an extra mana to double effects with Inalla, Archmage Ritualist becomes limiting on the small scale, and the cost begins to add up later on. With Naban, Dean of Iteration that problem doesn’t exist, and we can mostly double up for free. With that said, what does Naban actually do? Hmm… Where does this sound familiar? Oh yeah, that’s where. Naban is a wizard version of the highly played and beloved Panharmonicon. While we may be limited to Wizards with Naban, costing only two mana for this effect is a worthy and powerful trade-off. Not only that, we can easily include Panharmonicon in the deck to give us even more redundancy. Now that we know how powerful of an effect we’re working with, how do we leverage it? One of the things I immediately realized when looking through the list of wizards available was that nearly every impactful wizard that I wanted to cast fell between converted mana costs two and four. This presents a really interesting and strong dynamic that allows us to effortlessly curve from Naban into almost any of these other wizards. When an average person thinks of a “wizard” they most likely think about casting spells and using magic. If we think that our wizards are “casting a spell” as they enter the battlefield, it’s a lot easier to imagine Naban doubling each of those spells. For Magic one of the most evocative things that a wizard can do is draw cards, or in a Vorthos-sense dig deeper into their library of spells. 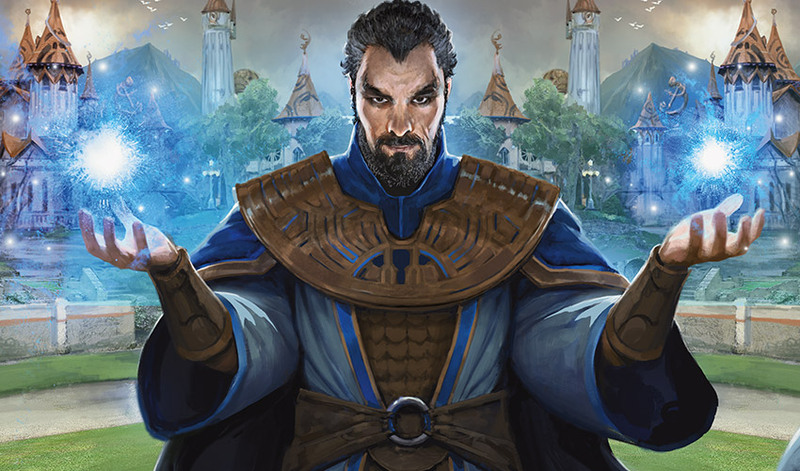 It’s one thing to look at Merchant of Secrets as drawing a single card, but with Naban as our commander, Merchant is more often than not a draw-two on a body. Evoking a Mulldrifter is a popular play, and Merchant becomes that while also sticking around. Once we start looking at these effects through the lens of doubling them, we can see where Naban begins to shine. Sea Gate Oracle no longer digs two cards for a single card. Rather, he now digs four cards deep for two cards (in increments of two.) Champion of Wits looting twice as a base option is a good rate, but when that effect now digs four cards deep? The sheer amount of card advantage begins to add up. Let’s not ignore if we are able to Eternalize the Champion of Wits either. If we’re able to do that, over the course of the two triggers we dig eight cards deep. That type of card advantage is hard to match. I would be remiss if I didn’t mention Archaeomancer. Archaeomancer is the seventh most-played mono-blue creature, and there’s a good reason why. Recurring a needed answer is already powerful, so what about grabbing two? Well, that would be crazy talk, but that can likely be the norm in this deck. Re-imagining wizards with doubled effects is certainly powerful, and we’re not done yet. Now what happens when we add more cards to the mix? We don’t just have card draw, we also have tutors. This gives us a huge breadth of effects that we can immediately curve into after playing Naban. Trinket Mage is already a staple of most blue-based decks. Over 14,000 decks play it, and it’s not a surprise. It’s a silver bullet creature that can grab a variety of answers. Even at its most generic, it can grab Sol Ring. It can also grab Expedition Map, spellbombs, a variety of grave hate, and even value cards like Skullclamp. That’s what it can do without the Dean watching. Once we factor in Naban, tutoring for any two Trinket Mage targets and keeping both is insane. The same thing holds true for Trinket’s other relatives. Trophy Mage being able to tutor for both Crystal Shard and Cloudstone Curio is ridiculous. The three-drop spot for artifacts is very heavy, so we have plenty of options. Treasure Mage is the hardest of the three to sell specifically for Naban, but if you have multiple targets for it, it’s an amazing inclusion. Notable cards that Treasure Mage can find? Wurmcoil Engine, Steel Hellkite, Caged Sun, Duplicant, Torrential Gearhulk, and more. If you have been following the recent Battlebond spoilers, you may have noticed a new wizard of the block that falls into this card-advantage bubble. This one may be the strongest one of them all as well. Spellseeker lets us tutor for an instant or sorcery of converted mana cost two of less. Not only does Spellseeker search for two different types of spells, it also finds a wide range of them as well. I haven’t even begun to look up what all Spellseeker can find, but the fact that she can often find two of Counterspell, Dramatic Reversal, Mystical Tutor, Cyclonic Rift, Swan Song, Pull from Tomorrow, Reality Shift, or High Tide goes beyond reasonable expectations for what should by allowed be a three-mana creature. If we look through that list, that means we can find mass card draw, counter-magic, wraths, combo-pieces, and even a tutor for a bigger spell. She’s insane, and I expect to see her in decks way beyond Naban’s power. In summary, Naban turns nearly all of our three-drops into “draw two cards” in some way. Drawing cards isn’t the only fun thing that Naban teaches at the Tolarian Academy. What’s better than drawing cards once? Drawing cards over and over against. One of the best ways to reset our creatures is going to be bouncing them in one way or the other. This is where the relatively cheap cost of our wizards is really going to pay dividends. First up is the creature that turned my opinion of Naban’s potential. Aether Adept is the strongest bounce effect on a body that wizards has access to. Costing only three mana, Aether Adept can come down early and bounce two opposing creatures for control purposes, or it can bounce one opposing creature and itself. With Naban, Aether Adept can consistently reset itself while probably a consistent stream of soft-removal. We can even reset our other pieces as well to help us dig for whatever cards we need. Next up is a personal favorite card of mine, and one I hope gets a reprint in the near future. Cloudstone Curio lets us bounce any of our wizards whenever we play a second one giving us another way to reset our ETB abilities. That’s not the only thing though. We can also reset powerful land abilities like Nykthos, Shrine to Nyx or something as simple as Halimar Depth. We can also bounce cycling lands to our hand in a pinch if we value draw power over mana at the time. Also, it’s a three-cost artifact which means it’s tutor-able with Trophy Mage. Joining Cloudstone Curio in the tutorable utility artifact category is Crystal Shard. It’s another way to bounce our creatures for free even if it’s once per turn. Additionally, if we catch an opponent who has tapped out, we can also set them back ever so slightly. Paradoxical Outcome is a card that I have to find a reason NOT to include in every blue deck I make in recent memory. It functions as board-wipe protection, card draw, and another reset ability for our deck. Being able to save our permanents from a board-wipe is strong enough on its own for the mana cost (especially in blue), but the card draw really puts it over the top. Even if we want to reset a few of our cards before our turn, that’s still great value. Imagine bouncing a single creature and a planeswalker like Tezzeret, the Seeker. Not only do we get to replay those two cards, we’ve also drawn two on top of it. It’s a fantastic card that fits very well within this deck. Not only do we get to re-purpose more popular cards for our needs, but we also get to dig into some obscure selections. Equilibrium adds an extra element of control to our arsenal as well as a way to… you guessed it, bounce our own creatures. Sunken Hope is a bit more a strange inclusion, and I think this is more of a meta call. While it can be good to buy time, there’s also the off-chance that you can benefit your opponents more than yourself. Use with caution. So what do we do with all of this card-advantage that we should be generating with this deck? Beating a player down with Snapcaster Mage may be a valid win-condition in Vintage, but I think that may not work in Commander… just a feeling. Unfortunately, Blue isn’t really known to win through combat, so often we need to look towards control or combo win-conditions. “Dramatic Scepter” as it’s known is a powerful combo that allows us to generate infinite “casts” for the sake of storm counts with mana rocks that can produce two mana, but we can also generate infinite mana if we can produce three mana or more with those same mana rocks. Once we generate infinite mana, it’s all about whatever massive spell we want to end it with. We can cast Blue Sun’s Zenith or Increasing Confusion or any other option we want. While I said blue usually doesn’t win through combat, it might be possible in a tribal-wizard deck. Docent of Perfection and its flipside Final Iteration provide a stream of wizard tokens that turn into Pauper and Legacy’s favorite flyer, Insectile Aberration. Evasive beats has been a winning recipes in many other formats, and I figure we can make it work in commander as well. While most wizards that generate extra value with Naban fall between two and four mana, that doesn’t mean we get to neglect the higher CMCs as well. Hailing from Commander 2017, Galecaster Colossus gives us a repeatable soft-lock if we can build our board enough well enough. While this is unlikely to work against multiple opponents, this can help close games out when the game winds down to a few players. I hope you have enjoyed this read, as I have really enjoyed brewing Naban. Below is the deck-list I have been working on, but I will warn you that it is in need of a serious overhaul thanks to Spellseeker and many other considerations I keep discovering about this mono-blue legend. I hope this has given you some respect for our Dean of Iteration, and maybe it will inspire someone to give him a chance. Thanks for reading, and thanks for joining me in the Underdog’s Corner!